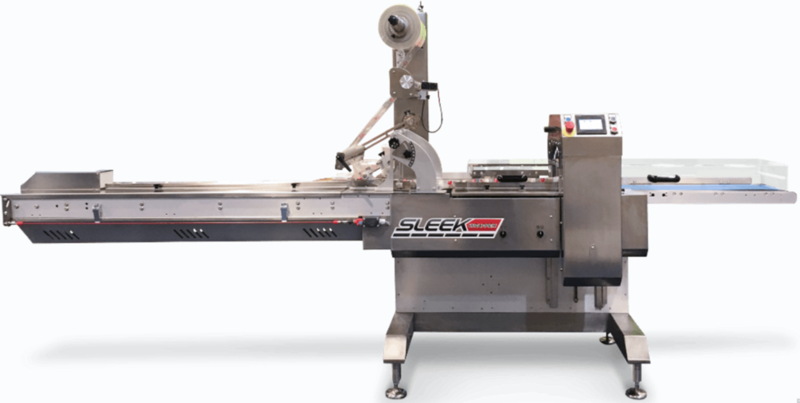 SleekWrapper, part of the Paxiom Group, recently introduced the new fully servo-driven horizontal flow wrapping machine—the Sleek 45 Wrapper—designed with reliability, simplicity, cleanability, and serviceability in mind. The innovative flow wrapping machine combines all the features of bigger machines at a lower cost. Built in a heavy duty stainless steel frame, the new Sleek45 Wrapper is capable of handling up to 150 packs per minute. A fully adjustable forming box makes it suitable for food and non-food products, even medical equipment. The economical 4-axis Sleek45 uses four non-proprietary Mitsubishi servo motors and servo drives that create quick and easy changeover and adjustment. No chains, no gears, no lubrication needed. Additional benefits are higher speeds, and lower maintenance costs compared to the old mechanical and 2-axis machines still on the market today. The Sleek45 Wrapper is equipped with an easy-to-operate 7” color touch screen and is built to quickly recall specific recipes with its 100-product memory setting. Other enhanced features include a no-product no-bag setting, no gap / no seal for misplaced product, automatic opening of the heated wheels to prevent burning of film, and automatic homing of the jaws when changing over to different product sizes. The Sleek45’s cantilevered body and infeed are designed for easy cleaning and maintenance to ensure the highest levels of hygiene. Infeed is designed with quick release hinges, allowing the cleaning process to be completed in mere minutes. This flow wrapper is extremely compact, making it ideal for usability in a limited production space.